So says Nick Barisheff (www.bmgbullion.com) in an article* which Lorimer Wilson, editor of www.munKNEE.com (Your Key to Making Money! ), has further edited ([ ]), abridged (…) and reformatted below for the sake of clarity and brevity to ensure a fast and easy read. The author’s views and conclusions are unaltered and no personal comments have been included to maintain the integrity of the original article. Please note that this paragraph must be included in any article re-posting to avoid copyright infringement. Asset allocation is usually taken for granted as being a mix of the three main asset classes: stocks, bonds and cash. Many investors believe that a broad mix of equities (financials, healthcare, utilities and telecoms), an exposure to foreign stocks, some emerging market plays, some bonds and a foundation of cash, equals diversification. However, this traditional approach is not only outdated, but also completely excludes several key asset classes such as foreign currency, real estate, collectibles,precious metals, natural resources and life settlements…(which should all be examined and, if necessary, rebalanced…annually because markets are constantly changing due to the unstable global economic climate). Stocks: The Dow has experienced several cyclical up and down trends throughout the last century. Identifying which trend the market is currently experiencing is of paramount importance. For example, a 60-year-old investor allocating to stocks in 1968 would have been 87 before breaking even, adjusting for inflation, in 1995. Bonds: The bond portion of a portfolio faired just as poorly during the 1970s. Bonds are decimated during periods of rising inflation, and in the 1970s inflation rose to over 13%. A mutual fund bond investment fared even worse during that decade; the net asset value of a bond fund drops as inflation takes hold and subsequent interest rate rises eat into the purchasing power, and then the price, of the fund. Commodities: Perhaps more crucially, a portfolio limited to stocks and bonds during the 1970s would have missed one of the greatest commodity booms ever experienced. From 1971 to 1980, gold rose by 2,300%, silver by 2,400% and platinum by 900%, while oil rose 900%. Most investors’ experience with investing is based only on the last cycle. They find it difficult to rebalance their portfolios in order to align them with changing trends, having become entrenched in one mindset…Today’s investors are convinced that equities will continue to provide superior returns during the next 20 years. Many feel the financial turmoil of 2008 is behind us, that the worst is over, and are blindly looking forward to further gains on the stock market. This mindset fails to acknowledge today’s financial reality. In fact, economic conditions today are much worse than in the 1970s. Government spending around the world has exploded and continues to do so. Fiat (paper) currency supply, along with government debt in the world’s major economies, is spiraling out of control. The situation is worsening daily, and burgeoning inflation can be the only result. Crucially, the world’s debt will inhibit governments from substantially raising interest rates– today’s economies couldn’t withstand a high interest rate environment. These are the reasons gold has risen constantly, year after year for nine years, and will continue to do so. In truth, gold isn’t just rising; fiat currency values are falling through debasement by their governments. The more dollars created, the less each one is worth. Gold protects investors against inflation, because it is a non-depreciating asset. Equity markets are topping. From a purely analytical point of view we can see that equity valuations are high, and there is more potential risk than reward. It is time to rebalance portfolios. The Dow:Gold Ratio, which measures trend changes in the price of gold versus a basket of stocks as represented by the Dow, supports the idea that investors today should have an allocation to precious metals. Essentially, the Dow:Gold Ratio divides the Dow by the US-dollar gold price. When the ratio is rising, as it did in the 1920s, 1960s and 1990s, portfolios should be overweight equities. When the ratio is falling, as it did in the 1970s and is doing today, portfolios should be overweight precious metals. What is an Appropriate Allocation? Today’s typical “balanced” portfolio, consisting of 60% equities and 40% bonds, will simply lose value year-after-year in real terms during the coming high-inflation cycle. According to a study by Ibbotson Associates, a 7% allocation to gold is needed in conservative portfolios and a 16-17% allocation is required for aggressive portfolios. Those amounts are required simply to have a balanced, diversified portfolio during stable times, i.e. strategic allocation. From a tactical allocation standpoint, Wainwright Economics [read article here (1)] looks to gold as being a leading indicator of future inflation. In a high inflation environment, which the ongoing currency creation around the world all but guarantees, their conclusion is that you need 15% in a bond portfolio and the same percentage in an equity portfolio just to insure your investments against further inflationary damage. The percentage mix is debatable; what is certain, however, is that the historic three-asset-class allocation mix is outdated, out of touch with today’s economic and financial reality and a recipe for loss of wealth. To protect your portfolio and preserve your wealth, a 5 to 20% allocation to precious metals is an absolute necessity. 1. 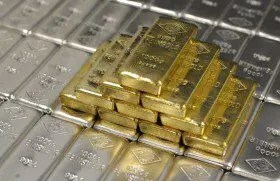 How Much Gold Bullion Should You Have In Your Portfolio? 3. Americans: Which Gold/Silver Bullion Assets are Permitted in Your IRA?